By knowingly or unknowingly we might have selected some app as default one for specific functions like browsing, watching videos etc. Later , if you want to change the default application to some other app, then follow the procedure shown below. 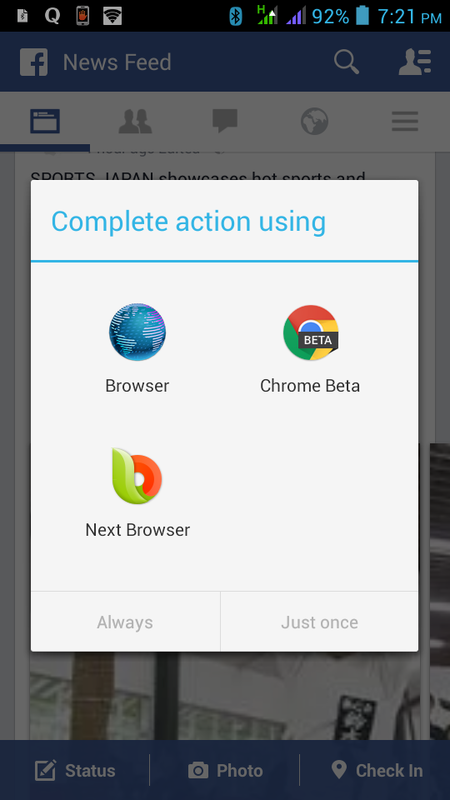 As an example, here the Default option is shifted from Android browser to Chrome Browser. 2.In settings , Select and Go inside Apps. 3.Now look for the app that you need to remove the default option. For example, if you want to disable the default option for system browser, then select Browser from the list. 4.Now tap on the option Clear defaults. 5.Now if you click a web link on some other app like whats app, a pop up will ask , "Through which browser, you have to open the link"
6.Select some other browser like Chrome and tap on Always. 7.In Future , all the links will be opened through Chrome browser. In the same way you can shift the default option to any other functions like watching videos, Viewing Pictures, Editing Documents etc.